A German court has acquitted a Moroccan man accused of assisting three of the 11 September hijackers. 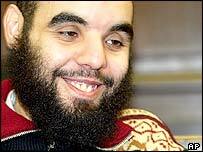 Abdelghani Mzoudi had admitted being a friend of the three men while they lived in Hamburg, but denied any prior knowledge of the US attacks in 2001. Mr Mzoudi, 31, had faced charges of aiding and abetting the murder of several thousand people. The trial judge said the evidence was not strong enough for a conviction, but said doubts remained over his conduct. "You have been acquitted and this may be a relief to you, but it is no reason for joy," Judge Klaus Ruehle told him. "You were acquitted not because the court is convinced of your innocence, but because the evidence was not enough to convict you." Mr Mzoudi was also cleared of a lesser charge of being a member of a terrorist organisation. In December, Mr Mzoudi was released from custody for the remainder of the trial after a statement emerged from an unnamed source that was widely believed to be Ramzi Binalshibh, another alleged member of the cell currently in US custody. It said the Hamburg cell consisted only of Mr Binalshibh and the three suicide hijackers. Prosecutors launched a last minute challenge on Thursday, which delayed the verdict by two hours, saying a fresh look at Mr Binalshibh's evidence could back their case instead. The lawyer, Andreas Schulz, urged the court to contact the US Justice Department to try to obtain Mr Binalshibh's evidence. But Judge Klaus Ruehle rejected the challenge, saying that the US authorities had not allowed Mr Binalshibh to testify during the trial so transcripts of his interviews could not be used. The judge, as part of his summing up, said he realised that the verdict may be received with bitterness, as a setback in the so-called war on terror, but the court had to follow legal procedures. Mr Schulz said it showed that it was impossible to get a fair trial of a terrorist case in Germany. But defence lawyer Michael Rosenthal told a news conference: "This is a great day for justice. We're very proud of our justice system." The prosecution has said it will appeal against the verdict, which means Mr Mzoudi will stay in Hamburg for the time being. However he eventually may face deportation to Morocco, where there is a chance of him being handed over to the US authorities. French news agency AFP says Mr Mzoudi is reported to be seeking asylum in Germany to avoid arrest by the US. Mr Mzoudi was arrested in 2002 after witnesses said he had trained at an al-Qaeda camp in Afghanistan. He admitted knowing three of the men who later hijacked the planes used against the World Trade Center and the Pentagon, including the alleged ringleader Mohammed Atta. But he insisted he knew nothing of the terror plans. The ruling on Mr Mzoudi could affect an appeal in another 9/11 case, that of Moroccan Mounir al-Motassadek, convicted on the same charges as Mr Mzoudi last year. Germany's federal appeal court is due to rule on Motassadek's case in March and has already suggested that the prosecution evidence should have been stronger. "After a five month trial he's still refusing to answer any questions"